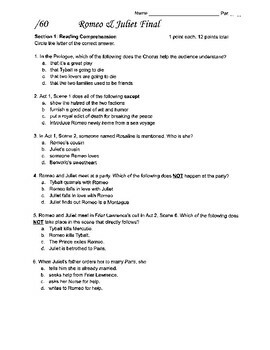 I gave my students 7 options to choose from for their final, based on their strengths (reading/writing/speaking/listening). I even told them they could get extra credit if they wanted to do more than one. I teach at an alternative school, so this was a good way for some of them to recover their grade by doing 2 or 3 finals for 60 points each. 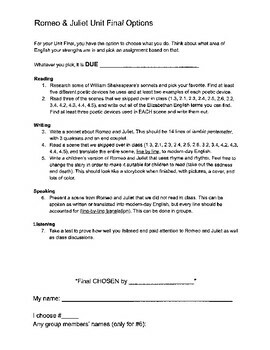 Included is the options sheet, the final test (one of the options) with the answer key, and the presentation (another option) rubric. 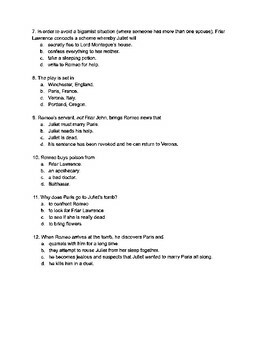 The test can be used even if you read the entire original play, the questions and answers will be the same.